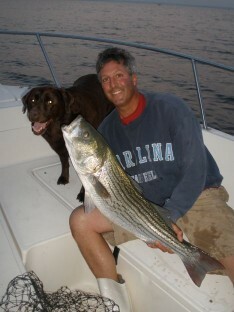 Free Fishing Reports > Northeast > New York > North Shore > Mocha & the Crew caught Bass despite picky bite! Mocha & the Crew caught Bass despite picky bite! 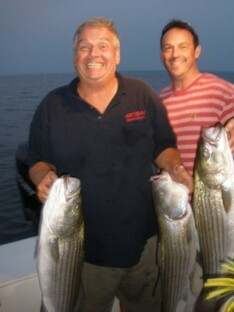 Laurel & Hardy with their catch! As the moon goes to the quarter stage, the bite window for the Bass has changed a bit. Capt. Skip, Kenny and Mike worked hard for over 2 hours before the Bass bite turned on. When it did, the crew boated 5 fish from 10-15 lbs, or from 30-36 inches. The bite then shut off as quick as it started! Mocha was still happy with the catch and being on the water with the guys!